Hundreds of asylum-seekers are cutting or burning their fingertips to prevent identification by EU authorities, Swedish officials say. The EU has a joint database where all asylum-seekers' prints are stored. If migration officials discover applicants have already had their case heard in another EU state, they are liable to be sent back. Swedish officials have disclosed that hundreds of asylum seekers' prints show signs of injury. 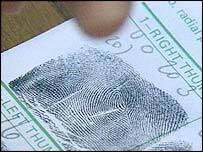 The Swedish Migration Board identity expert said that about 5% of the 26,000 sets of fingerprints it had taken since January 2003 were not legible for identification. Bengt Hellstroem, an identity expert at the migration board, told BBC News Online said a few hundred of those were obviously due to mutilated fingertips. He said mutilation appeared to be increasing among asylum seekers. "We see everything scars from knives and razors, or entire (fingerprint) patterns that are entirely destroyed because they've used acid or some other kind of product to destroy their hands," he said. "I don't think this is special to Sweden, the more north you come in Europe the more you will see it." Sweden attracts asylum seekers from across the world, mainly from Somalia, Serbia and Iraq. An 18-year-old asylum-seeker called Hassan told Swedish Radio he had mutilated his fingers after applying for asylum in Italy but later deciding to go on to Sweden. "I turned on the stove and waited until the burners were hot.," he said. "Then I placed all 10 fingers on them. When my hands were burnt I took them off and put oil on them. Then I put my hands back on the burners and burned them again." Mr Hellstroem said removing fingerprints was not as dramatic as it sounded. "It is very easy to mutilate and you don't do any lasting damage," he said. "You really only destroy the outer layers of the skin and barely have time to register the pain." He said he would like to see more stringent checks such as biometric identity checks, where both fingerprints and the iris of the eye are scanned.